Electroplating, or electrodeposition, is one of the most important processes in chemistry, in which a metal cation in solution can be reduced to its elemental form by applying an electrical potential to an electrode. This enables electrical contacts to be made in integrated circuits with nanometric precision. Despites decades of research worldwide, visualising the early stages of electrodeposition - the formation of the first nucleus - remains a formidable challenge. A collaborative work involving the University of Bristol's Schools of Chemistry, Physics and the Bristol Centre for Functional Nanomaterials CDT has come up with an entirely new approach to monitoring the process leading to the birth of a nucleus in real time. Writing in the journal Nature Communication, the team show how detecting very small local perturbation of the water structure near the surface, the complex dynamics of early stages of electrodeposition can be tracked. David Fermin, Professor of Electrochemistry and lead author of the work, said: "This is a very exciting development which pushes the boundaries of spatio-temporal resolution of electrochemical processes. "There are highly sophisticated methods which allows monitoring phenomena at the atomic scale, but compromising the dynamics of the process, while other methods can follow very fast dynamics but we can't 'see' where they happen in space." 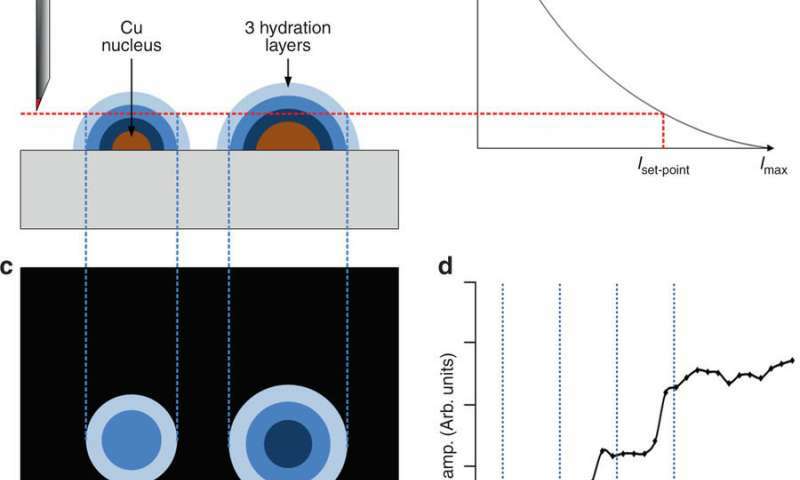 Employing Lateral Molecular Force Microscopy, developed by the team of Professor Mervyn Miles at the School of Physics, the team were able to spot the formation of a metallic nucleus by following perturbations of visco-elastic properties of hydration layers with nanometer resolution. This microscope works by detecting small changes in the oscillation of a very sharp tip as a result of the sheer force introduced by water layers. The fascinating aspect of this approach is that we can detect very subtle changes in the structure of water in real-time. According to Professor Fermin, this is just an example (and a very challenging one) of the new science that this unique microscope can unveil in fields such as interfacial electrochemistry and catalysis for energy.